Don't let the picture fool you; the real story is in the background. On October 27, 2015, 343 Industries released the latest entry in the Halo series - Halo 5: Guardians. Being the second entry in what 343i dubbed as the “Reclaimer Saga”, it’s fair to say that Halo 5 had to meet certain expectations. The story should build off from the previous entry, the new threat should prove more dangerous than the last, new characters should be introduced, and we should be left prepped for the next entry in the series. For the most part, Halo 5 delivers on all accounts. It’s just unfortunate that Halo 5 fails to finds its own identity along the way, avoiding big risks with the series formula and potentially standing out from the rest of the series. It’s not to say that Halo 5 isn’t a good game; it is. Regarding the campaign, the gameplay is as solid as you would expect it to be for a Halo game. Battles are epic and the overall narrative is captivating, eventually setting the stage for the inevitable Halo 6. New characters make their appearance, and new gameplay mechanics, referred to as “Spartan abilities”, are introduced and work very well. 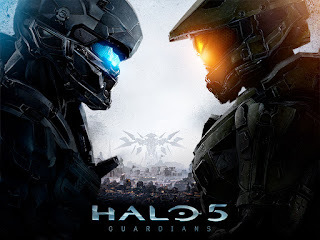 What Halo 5 struggles with is which plot is most important: the main plot (which won’t be spoiled here), or the subplot between the game’s two leads: the Master Chief and Spartan Locke. Treading on familiar ground akin to Halo 2’s shifting perspective; Halo 5 has the player switching between the Chief and Locke. Microsoft’s rather misleading ad campaign focused heavily on an implied resentment between the two, which is greatly exaggerated when compared to the in-game interactions nor reasonably explained for existing. In fact, when our two leads finally do meet, the moment feels forced and is quickly dismissed after a brief exchange of fists and a cold stare. It’s a poorly developed subplot that the game tries very hard to convince the player of its importance, but does little more than undermine the far more interesting main plot of the story. Fortunately Halo 5’s excellent multiplayer makes up for any lingering disappointment left after the credits roll. “Arena”, Halo 5’s classic multiplayer mode, brings the Halo competitive experience back to form. Halo 4’s multiplayer was arguably a mess, thanks to 343i’s attempt to modernize it with “Call of Duty-inspired” mechanics. Weapon load-outs and support drops stripped away the balance and skill-based gameplay the series was known for. “Arena” marks the return of that level playing field fans of the series loved, where skill is key to victory; not luck of the supply drops. However, 343i didn’t completely do away with what they started in Halo 4’s multiplayer mode, instead simply giving it a separate playlist called “Warzone”. A team-based, large-scale objective game mode, “Warzone” has players fighting over control points as well as fending off AI opponents that appear periodically. During the match, points are earned which players can use to requisition weapons, armor abilities, or vehicles. Requisitions are obtained via Req Packs; digital collections of cards that can either be earned by simply playing or by purchasing with real money. At the time of this review, "Warzone" is a sorely unbalanced affair. While players may start off on equal grounds, matches often tilt in one direction early on and tend to remain favor of the leading team. It's a chaotic affair that some players may enjoy, but those who were not fans of Halo 4’s multiplayer, it's best to steer clear. Halo 5’s campaign, while solid in many regards, does little more than provide set up for the next entry in the “Reclaimer Saga”. The story suffers mostly due to Microsoft’s mishandled marketing, as well as 343i’s unwillingness to take any real risks with the series formula. Fortunately Halo 5’s “Arena” mode offers a bit of redemption by returning the series’ competitive multiplayer experience back to form. (It also has Nathan Fillion starring in the game, so it has that going for it.) Long-time fans of the series will definitely want to give Halo 5 a playthrough; if anything to be surprised and left intrigued by the main plot given the outcome of Halo 4.